At DeRos Delicacies, our professional staff is committed to creating beautiful pastry baskets and gifts which are perfect for any occasion. As a trusted local florist, we offer flower delivery throughout St. Clair Shores, MI and surrounding areas, as well as nationwide delivery through our network of reliable florists. DeRos Delicacies also offers convenient same-day delivery for all of your last minute gift needs! What’s the perfect gift for any occasion? Fresh Pastry Baskets from DeRos Delicacies, your local florist in St. Clair Shores, MI. We have all kinds of beautiful arrangements, from Mother’s Day flowers and birthday flowers to Valentine’s Day or anniversary flowers – so you’re sure to find the right gift for that special someone. We also offer sympathy & funeral flowers as well as get well flowers to help you show them how much you care. No matter your taste or your budget, trust DeRos Delicacies for quality floral gifts and arrangements delivery in St. Clair Shores. Looking for the perfect gift that you can order and deliver with ease? DeRos Delicacies has a wide variety of floral gifts available on our website. No matter the occasion, you can trust our local St. Clair Shores florists to arrange a beautiful floral bouquet that is guaranteed to please. When you want the freshest flowers delivered to that special someone, trust DeRos Delicacies for floral delivery in St. Clair Shores or nationwide. You can trust the florists at DeRos Delicacies in St. Clair Shores to create dazzling basket arrangements.. Our St. Clair Shores gourmet shop also has a wide variety of gift baskets and plants for every occasion. Ordering from DeRos Delicacies guarantees that your gourmet baskets will be hand-delivered with care. 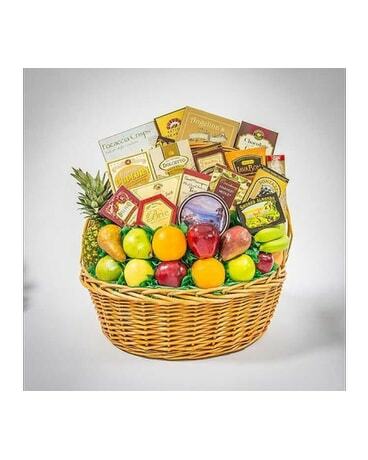 Your special someone deserves the very best, so send a basket from one of the top gourmet stores in St. Clair Shores MI.